JD of TIAT recently made a YouTube video tutorial on 'How to tie a Dragon's Tongue'. I followed the tying method, but instead of two separate paracord strands, I used a single 12 foot long strand of paracord with a 5/8 inch side release buckle, to make a 9.5 inch long paracord bracelet. Once I looped the center of the paracord onto one end of the buckle, measured for wrist length and looped onto the other buckle end, I had two working ends and two core strands to weave around, like shown in the video. 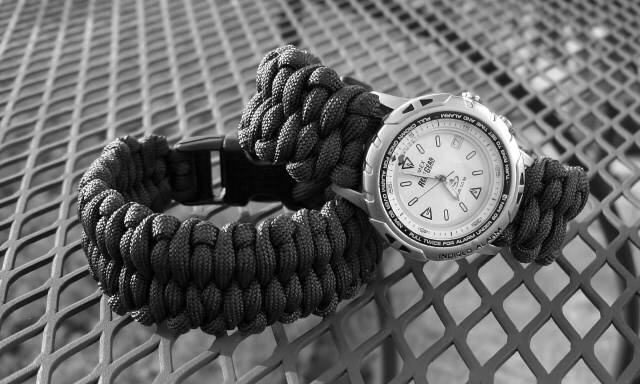 The ends of the paracord were tucked into the weave on the underside of the bracelet with hemostats to finish. The video tutorial has the paracord stretched out, after weaving, for the 'lashing' tongue effect, but I left the cord bunched up to use more cord in the bracelet, and I prefer the wider effect of the weave. The 9.5 inch finished length was actually a loose fit for my 8.5 inch wrist, so I'll probably untie it and adjust it to my wrist size instead of adding length, which is sometimes required with other paracord bracelet methods. A watch could be added midway through weaving for a wide watchband, or add something else like a compass, skull bead, etc... And it also works as a pet collar or you can adapt it for use as a lanyard or fob. 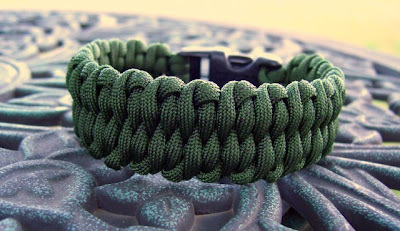 If you want to increase the amount of paracord used and don't mind a thicker sized paracord bracelet, you can run extra cord back and forth between the buckle ends a time or two more, for a four or six strand core which can be paired off and woven around, like the examples in this previous blog post. *After untying/retying the bracelet to 8.5 inches long for a better fit, I still used all 12 feet of paracord that I started with, and tucked the excess under the weave along the inside of the bracelet. 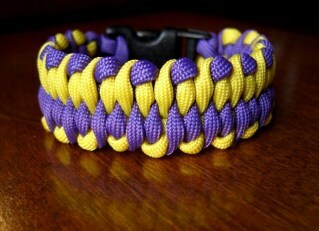 A two-toned version for a family member that's an LSU fan, and has been undergoing cancer treatment. I love this but how do you do it. I know you explain it but you never show it. Is there a way to see you doing it? For attaching your cord to a side release buckle, you can follow that part of a couple instructables, paracord bracelet and watchband show the attachment. For the 'Dragons Tongue tying method, just follow TIAT's video and start where the cords work around the core strands, after you've got the cord and buckles set up. Thanks for your efforts to always post something new and interesting. I'm a faithful viewer and really like your projects. I've recently started playing with paracord making bracelets laynards and other stuff. What I'd really like to make is a wrap around a little bottle of hand sanitizer like I've seen on other sites fit sale called the germ grenade. I can't seem to find any instructions for this but itlooks like a cobra stitch down the middle woven around the sides with a seperate cord. I think I got the gist of it but the ones I've tried kinda indicate that I'm missing something. How's about trying one out and showing us how it's really done. Thanks. Wow, that LSU dual color one looks awesome. Could you please try to explain how exactly you got the alternating color scheme started? It appears in the "tying it all together" video that the guy uses a single string of paracord for the interweaving part of the bracelet- while you have two different strings. Mind expanding on how you did that?? For a two color bracelet, instead of one 12 ft length of paracord, you sew, melt, or super glue two 6 ft lengths of paracord together, so you then have a single two colored 12 ft cord to work with. You attach that to a side release buckle, with the connected section of cord in between the buckles to be knotted/woven over. 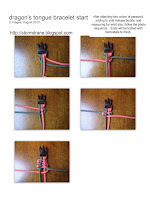 Here's a photo collage link for a quick start on tying the two color 'Dragon's Tongue' paracord bracelet. Do you have a tutorial for this one on Instructables? I've made lots of the regular bracelets but looking for something wider for dog collars. I've not made any more Instructables, as of yet. Doing a bracelet/collar in this method is started the same as other bracelet/collars as far as attaching to a buckle and measuring for wrist/neck length, and the knotting is done as shown in the TIAT video and the 'start' that I added to this blog post. I'd suggest using 1.5 feet of cord per inch of bracelet/collar length, to be on the safe side. I stumped upon the site after revising my hiking gear and wanting to get some paracord. This is brilliant. Can you recommended a good/illustrative book? I really like this for a bracelet! What's the exact color of paracord you used in the pictured bracelets (first)? It looks like olive drab but I'm not certain. I didn't buy the paracord used for this project, as it was given to me for Christmas last year. I don't know where it was originally purchased from, but the color on the label was listed as 'Camo Green'. Think you could put up a photo collage on how you finished this bracelet? I get how to start it, but the ending is screwing me all up. Is it possible to make this without the buckle? I would love to make this as a slip on bracelet. @ian, You could tie it with a knot and loop closure, loop at the start, knot at the finish. A slip-on could work too, but I haven't tied it that way. A little experimenting should get you there though. Really great site, as a retired USAF survival rescue ops rigger. I now have something to do with the 700 yds of 550 that followed me home in Apr 2000. I really love your site. I am planning on buying you book and making a Dragon's Tongue bracelet. Can you tell me how you connected the cord to the buckle. I am unable to tell from your pics. Thank you very much. 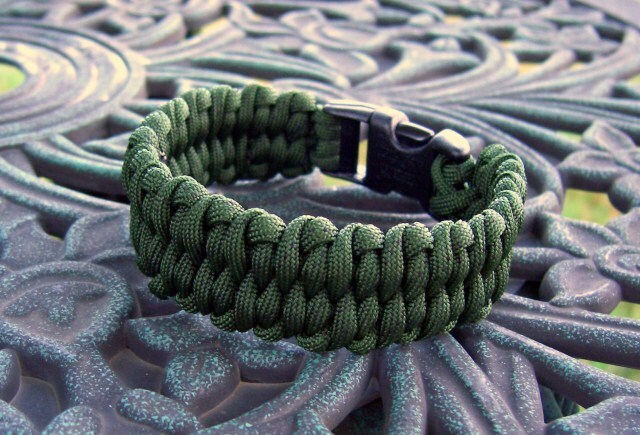 @eric, The method for attaching the paracord to the buckle, for tying the Dragon's Tongue bracelet, is done the same way as other paracord bracelets that use a two-strand core to do the knot work around. Look at another paracord bracelet tutorial, to see how the cord is attached to the buckle ends and adjusted for wrist size before knotting is started, then tie as instructed from there. Knot books generally show how to tie knots, braids, and sinnets, but not start to finish projects like a paracord bracelet. Once you learn how to tie the knots, you may have to figure out how to apply them on your own, or use other examples found online. Do you have a post that shows your technique for joining the ends of two different colored strands? @Jeff Jonsson, I usually tuck one end into the other and sew, melt, or glue them together. Example is seen in my snake knot lanyard instructable. Awesome blog as always. I find this to be a very frustrating knot to do. I seem to have issues keeping it tight without the cord popping up or down in the wrong spot. I'm getting it though. Do you just singe the knot when you're done? I only ask because JD uses the core strands to cinch it tight. @Anonymous, I tucked the ends instead of melting/singeing them, and I used one continuous length of paracord for the bracelet/watchband, instead of two separate strands like JD shows in the video. I have looked at your instructable photos however i am still clueless as to how you attached the to the buckle. I have been making these for awhile and am looking for a better way to do it. can you please explain the attachment or post a video of it? I would greatly appreciate it. wow, i keep coming back and rereading older posts, and keep seeing and learning ! I am a blogger at MidwestMoma.blogspot.com. My kids have been wanting a number of bracelets, key-chains and necklaces so naturally, I went to Pinterest for ideas, instructions, and such. I found your blog on there time and time again....I love everything that I have seen so far. As a fellow blogger, I appreciate you taking the time to put all of this material together!!! You are saving me a ton of money and giving me more ideas than are probably safe for a crafting mom to possess! !